This is Charlie. 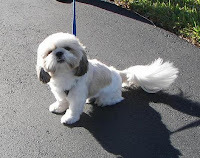 Charlie is a shih tzu and loves people, but he does not like other dogs. He enjoys his walk and, as you can see, is a real ham for the camera. Charlie lives in the next building, so I am sure I will see more of him. When I looked up the breed online I learned they are great pets but can be hard to housebreak. Since they are pack animals, you have to let them know who is boss or they will try to to be the leader which can cause behavior problems. Obviously, Charlie has been well trained. 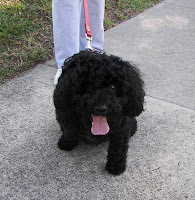 Maci (pronounced Mutt-z) is a Puli, a Hungarian Sheep Dog or Water Dog. They have unique corded hair which can reach to the ground on a fully grown adult. Maci had a nice hair cut so her coat was not long or tangled. She was very well behaved. I had never heard of the breed before and her owner told me all about her. I'm really enjoying getting to meet my new neighbors! Ty is all dog. A cross between a bull dog and a lab, his owner rescued him from the pound. (Two thumbs up!) She told me he is very friendly and would happily go home with anyone that invited him. He sat nicely to have his picture taken but I could tell would much rather have a tail wagging frolic. After such a nice walk I found this insurance salesman (with a British accent) waiting for me on the steps up to the condo. 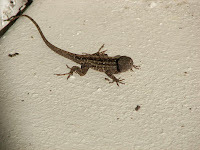 Geckos are everywhere down here. I can see as many as 10 or 12 just going to check the mail. Many of the residents don't like them because they leave numerous small black calling cards behind. All of the dogs have their owners well trained to follow along with plastic bags to clean up after them but no one cleans up after the geckos - except the many birds that eat them before they have a chance to make any more mess.